The headlines accompanying the release of the Coast Guard’s 2012 Recreational Boating Statistics earlier this week correctly trumpeted the decrease in boating deaths, injuries and accidents. That’s good news. If you dig past the accident information you will eventually find (starting on Page 64) the boat registration data for last year. And those figures also produced something of a surprise. After significant declines of more than 250,000 registered boats in 2010 and 2011, the number slowed in 2012 to just 72,000 boats, leaving the total number of registered boats at 12.1 million. I was not alone in expecting the total to come in below 12 million, which would have taken us back to 1996 levels. What caused the exodus to slow? Are we seeing a turn off the bottom, where significant numbers of folks are pulling their boats out of garages or backyards, taking the covers off and reregistering them? Are boaters who were chased to the sidelines by the recession finally feeling confident enough to say “I want to get back on the water”? Certainly some of those boats that fell off the registration rolls have been sold to new owners who are putting them back into service. And new-boat sales were up about 10 percent last year — not strong enough yet to offset the net loss in registered boats, but the trend is positive. There are other reasons that the rate of decline in registrations slowed, says Jack Ellis, managing director of Info-Link, the market research and analytics firm. Those factors include changes in state registration rules and the trend by more states to register human-powered vessels, such as canoes and kayaks, Ellis points out. The decline in motorized vessels from 2011 to 2012, for instance, was still about 100,000 boats, which is less than 1 percent, he says. States are making the case that because the growing human-powered fleet is taking more and more of their time and resources, they should be registered, which is a good discussion for another day. All that notwithstanding, the figures for 2012 indicate that the rush of boaters heading for the pastures has slowed and that new-boat sales are starting to offset the expected retirement of the oldest, most tired boats in the fleet — trends we hope will continue. 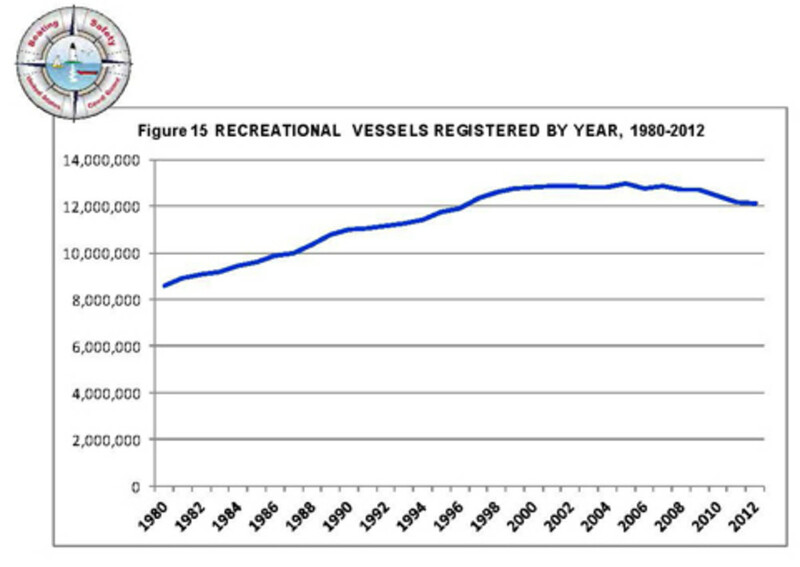 “The decline in boat registrations is good news/bad news,” says NMMA president Thom Dammrich. “Good news that it is better than last year, but bad news that it is still falling. Helping stem the tide — and certainly worthy of note — is the lapsed boat registration initiative developed and executed by the Recreational Boating & Fishing Foundation. This registration marketing program is patterned after the RBFF’s successful effort to bring lapsed anglers who haven’t renewed their fishing licenses back into the fold. Anglers who haven’t renewed are encouraged to sign up through direct-marketing efforts, including a four-color postcard. The angler program has contributed to the sale of 1.35 million fishing licenses since its launch in 2008, according to the organization. In 2012, the outreach resulted in more than 242,000 licenses sold and about $4.98 million in gross revenue. 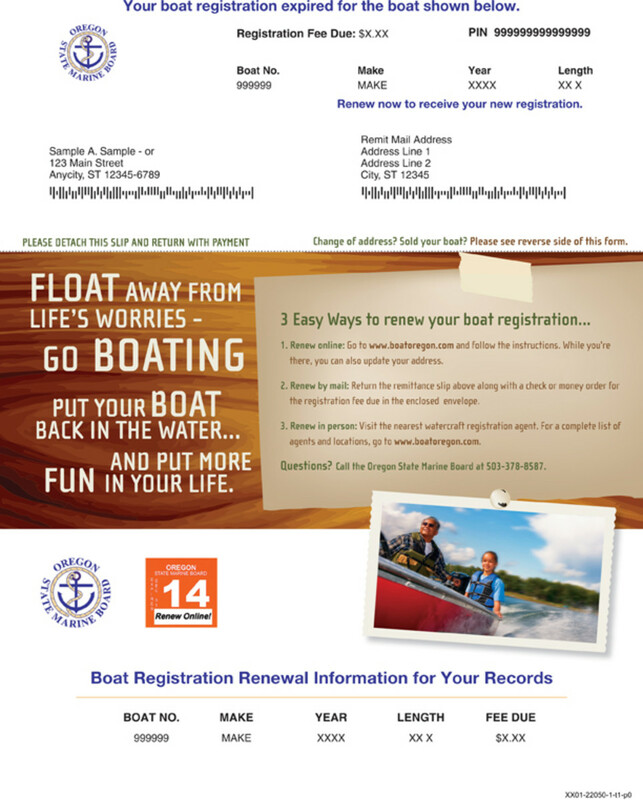 After a successful pilot program in Oregon, RBFF rolled out the boat registration program last year, sending direct-mail pieces to about 450,000 boaters in 15 states whose registration had expired, RBFF president Frank Peterson told me on Tuesday. That outreach resulted in more than 32,000 registration renewals (about an 8 percent response rate) and about $1.1 million for those states. This year, the March/April mailing went out to boaters in four more states. Peterson would be very happy to eventually reach maybe 1 million lapsed boaters in 40 states, which if the current response rates hold up could pull in 80,000 new renewals a year. Lastly, any talk about the large number of boats that have fallen off the registration rolls and seemingly disappeared invariably leaves people scratching their heads. “I don’t know how many times I’ve been asked, ‘What happens to boats when they die?’ ” Ellis says. Click here for videos that show the inglorious end that sometimes befalls what were once someone’s pride and joy.